Offers up to 50 Gallons Per Day in bottled water quality. Refreshing, Crisp Taste Superior to Bottled Water. Dimensions: RO Unit 14-1/6"L x 9 "D x 19H. 3x5 FT Embroidered Star American Flag. 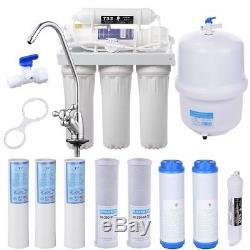 5 Stage Reverse Osmosis Drinking Water System RO Home Purifier 13 TOTAL FILTERS. 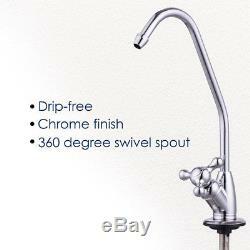 Can be attached to the kitchen tap or installed under sink. System only to be used on biologically safe water supply. Efficient to reduces: copper, lead, fluoride, cadmium, selenium, arsenic, cysts , barium, trivalent chromium, Odor, TDS many more. Operation Temperature: 37°F to 104°F / Maximum temperature 40°C. System Operating Pressure: 45PSI to75PSI. Quick connect fittings for easy installation. 1st Stage (Polypropylene Sediment Filter). Standard Size 2-1/3" x 10". Remove larger particles, dirt, silt, rust, sand ect. Protects and extends the life of the membrane and system. 2nd Stage (GAC Activated Carbon Filter). Standard Size: 2-3/4" x 10-1/4". 3rd Stage (CTO Coconut Shell Carbon Block Filter). Standard Size 2-3/4" x 10". Remove pesticide, odor, chlorine, bacteria, etc. Recommend replace every 16 months (varies depend on the water source quality). 4th Stage (Reverse Osmosis Membrane). Standard Size 2-1/5" x 11-4/5". 50 Gallons per day capacity. RO membrane pore size is the hair of five millionths(0.001 microns). Can effectively remove bacteria, organic, inorganic, metal ions and radioactive substances. 5th Stage (Inline T33 GAC Coconut Shell Carbon Filter). Standard Size 2-1/3" x 9-4/5". Removes any taste or odor the water may have in the tank and create a sweeter water taste. 3.2 Gallon Water Storage Tank (NSF Approved). Work pressure: less than 0.4MPa. 1 x 50 Gallons 5-stage Reverse Osmosis System. 4 x Polypropylene Sediment Filters. 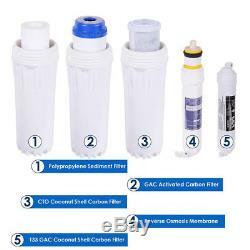 3 x GAC Coconut Shell Carbon Filters. 3 x CTO Coconut Shell Carbon Block Filters. 1 x Reverse Osmosis membrane. 2 x InlineT33 GAC Coconut Shell Carbon Filters. 1 x Water Storage Tank(NSF Approved). Notices: 3.2 gallon storage tank is used for stabilizing water pressure, so it is normal that it can not be fully filled. Please Note: Items may be delivered separately or in different time manner for better transit protection. Your satisfaction is our priority! If it's economy service, you may upgrade to UPS Ground during checkout. And you may also upgrade to UPS-2 Day or UPS 3-day Selected for most of the products. Please be noted that, this service is more recommended for Monday-Thursday orders. Orders on Friday may be processed on following Monday by UPS, according to UPS's policy. Our 30-day Satisfaction Guarantee assures our customers that they will receive all orders promptly and exactly as described. Our company was founded in 2002 and is one of the fastest growing Internet retailers-thanks to you, our customers. And the biggest compliments we have are the hundreds of thousands of repeat customers over the years. For example, if the item a. Doesn't match listing description b. Damaged or defective when received c. Chose the wrong size or feel that the product is not suitable for buyers himself b. No need this product after received c. Find a more suitable price elsewhere than choose a return. 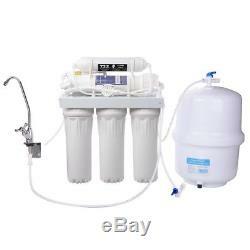 Reverse Osmosis System + 13pcs Filter + Water Pressure Gauge. 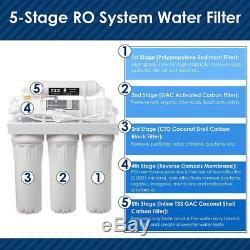 4 PCS Filter Replacement RO System. 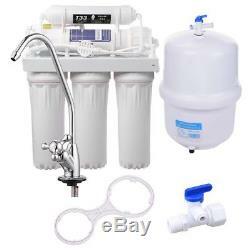 8 PCS Filter Replacement RO System. 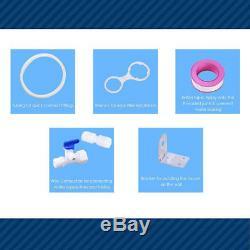 9 PCS Filter Replacement RO System. 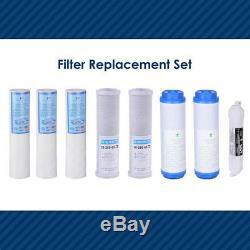 21 PCS Filter Replacement RO System. 5 Stage Reverse Osmosis System. The item "5 Stage Reverse Osmosis Drinking Water System RO Home Purifier 13 TOTAL FILTERS" is in sale since Monday, November 30, 2015. This item is in the category "Home & Garden\Kitchen, Dining & Bar\Small Kitchen Appliances\Water Purification\Water Filters". The seller is "apluschoice" and is located in La Puente, California. This item can be shipped to United States, Canada, Mexico.